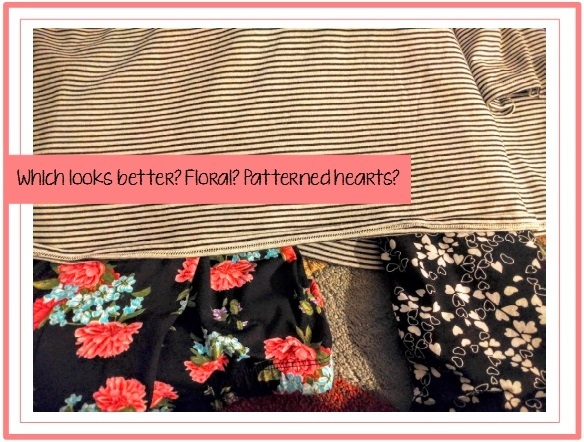 REFASHION 3: FLORALS AND STRIPES! Yay! My confidence level just took a step up with my latest refashion! I recently bought this normal black-and-white striped shirt on clearance. The shirt fits fine and looks nice. However, during a recent shopping trip with my sisters, I leisurely combed through the clearance racks and found a lovely pair of floral leggings. I know leggings are back in style, but for some unknown reason, I refuse jump into the trend again. Not to mention, I strongly agree leggings ARE NOT pants and a tunic, a sweater, or a simple shirt should be long enough to cover the tush. Anyway, I bought the cute floral leggings with absolutely no intention of wearing them. 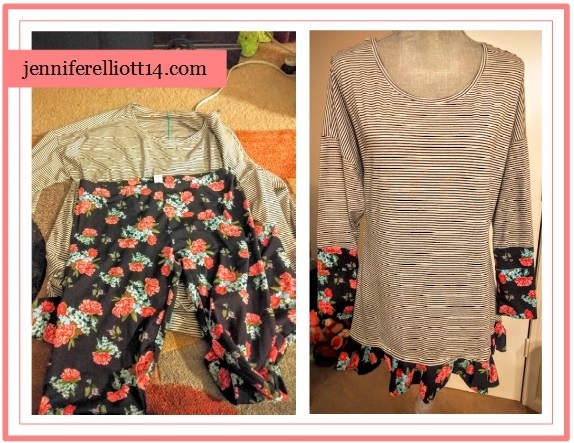 I immediately knew it would make my new striped shirt even better — turning the original 3/4 sleeves into full length sleeves and lengthening the shirt hem with the floral fabric. Plus, I’m starting small with the floral-stripe combination. If I can handle a striped shirt with contrasting floral additions, eventually I’ll feel confident to pull a floral skirt with a striped shirt (well maybe). I probably shouldn’t get too ahead of myself … let’s just stick to the shirt first. I am also shy about mixing patterns together but I see so many other people mixing and it looks great! i really like the mix here with the shirt. Not overwhelming. Really thought the stripes and floral would look great together. Would love to see the finished product.